LVIV, Ukraine -- Ukrainian President Petro Poroshenko on Friday risked further angering the Kremlin by suggesting that English lessons replace Russian ones in schools to improve the country's standard of living. 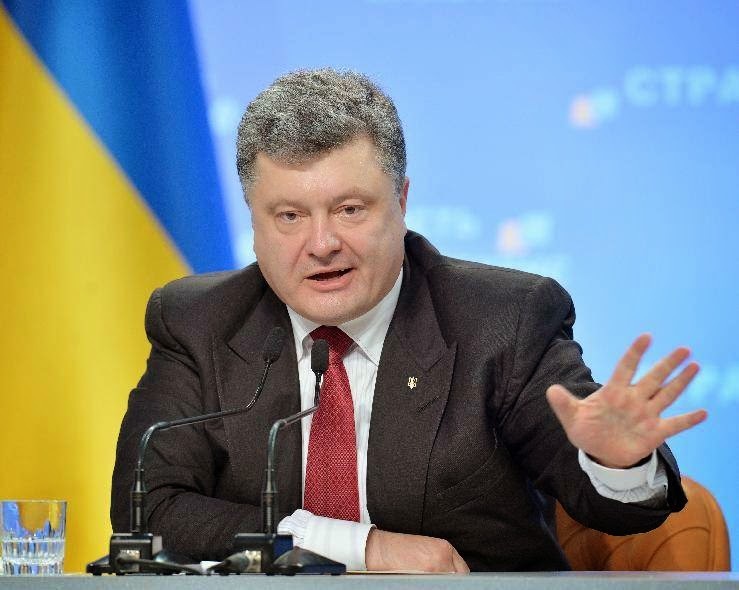 Ukrainian President Petro Poroshenko gestures as he answers questions during a press conference in Kiev. "English should become the second language to be taught in schools," Poroshenko said on a visit to Lviv, a nationalist bastion of political support for the new pro-Western leader where Russian speakers make up a minority. "There is a connection between people's standard of living and their level of knowledge of English," he said. "The more Ukrainians speak English, the better off Ukraine will be." Russian has historically been the second language in Ukraine, a country linguistically split into the Ukrainian-speaking west and Russian-speaking east, where pro-Moscow separatists have declared independence in two regions. The ousted Kremlin-backed leader, Viktor Yanukovych, signed a law in 2012 that ensured that Russian could be spoken freely in the east, a decision that angered nationalist politicians. Despite calls to repeal the law after a pro-EU uprising established new leadership in Kiev in February, the new leadership has decided to preserve Russian language rights in the east. Moscow has accused Kiev of "genocide" against Russian speakers in the industrial rustbelt, where a five-month insurgency has cost more than 3,500 lives. The Ukrainian government says that Russia has masterminded the violence in an attempt to prevent Ukraine from integrating with the West.